Welcome to First Baptist Christian Preschool! We sincerely desire to provide a relaxed, safe, and happy atmosphere for your child, and at the same time provide opportunities for learning and functioning happily with others his or her own age. Our purpose and main goal is to help your child develop a good self-image and genuine respect for others in a Christian atmosphere and in light of God's Word. Your child will be given numerous opportunities to develop responsibility and a desire to care for others. We are excited about working with your child in a Christian atmosphere. to hold your spot in the class. The 2-day classes are $85 per month. The 4-day class is $150 per month. 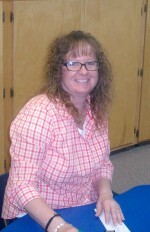 Crystal Schultz is our lead teacher. Crystal took the lead in 2012. She has been a part of our Preschool for over 13 years. She is well qualified in early childhood learning. She loves to see the pride on the children's faces as they learn new skills.